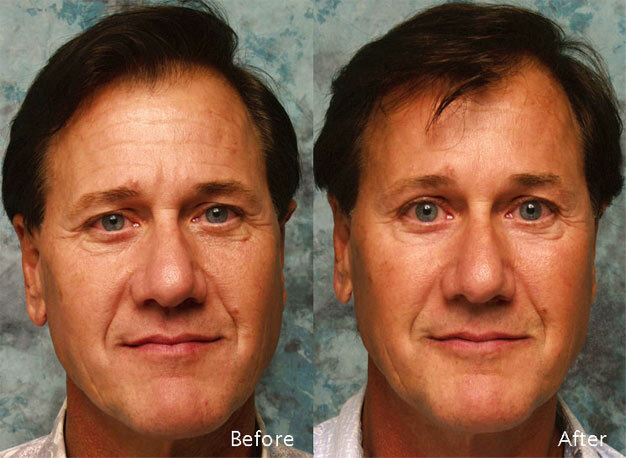 Lower eyelid surgery reduced the fullness of the lower eyelid by removing eyelid fat. 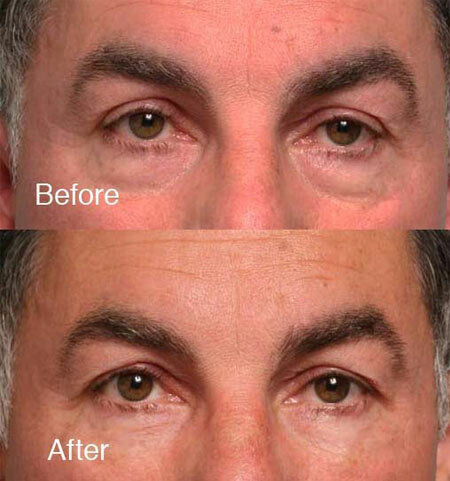 This tends to deflate the lower eyelid and slightly increase the lower eyelid wrinkles. The chemical peel performed at the time of the lower eyelid surgery, helps to firm the lower eyelid skin and reduce this tendency and avoids the need for surgery to remove the excess lower eyelid skin. 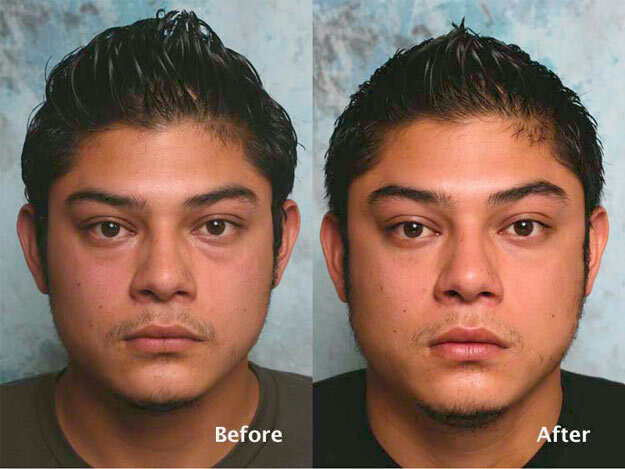 The result is an actual before and after photo of one of Dr. Steinsapir’s patients. Your results will vary. 22-year-old man bothered by the fullness in the lower eyelids. The fullness in the lower eyelid is due to orbital fat that is visible because of a descent of the cheek fat pad. Classically transconjunctival surgery to remove lower eyelid fat would be offered to an individual with this set of issues. However, due to the descent of the cheek fat, removal of the lower eyelid fat without addressing the descent of the cheek fat would only accentuate the hollow under the eyes. An arcus marginalis surgery was performed. This conserves the lower eyelid fat, which is rotated out of the lower eyelid space and onto the top of the cheek fat softening the lower eyelid hollow. Recovery is typically 8-10 days. Surgery can be performed in the office procedure suite under local anesthesia. 58-year old man who is concerned about looking fresher and younger. Midface lift over hand carved orbital rim implant. Note that his surgical results are very natural. He did not get all of his surgeries at once but rather had them over a period of 2 years to avoid call attention to the fact that he was getting cosmetic surgery. He was able to ease into his new, fresher look without others being aware of what he was doing. 54-year old man who is interested in looking younger and less tired. Hollow under eyes and dark circles. Upper eyelid blepharoplasty, skin only. It is critical that men not have all of their features removed by cosmetic surgery. Less is more. In particular, it is important to leave a little skin in the upper eyelid so that the eyes are not feminized. He had about 1 week out of the office but was able to conduct business by phone the day after his surgery. 54-year old man who is interested in enhancing his appearance. He feels his eyes make him look tired. Eyebrow ptosis with hooding of the upper eyelids. 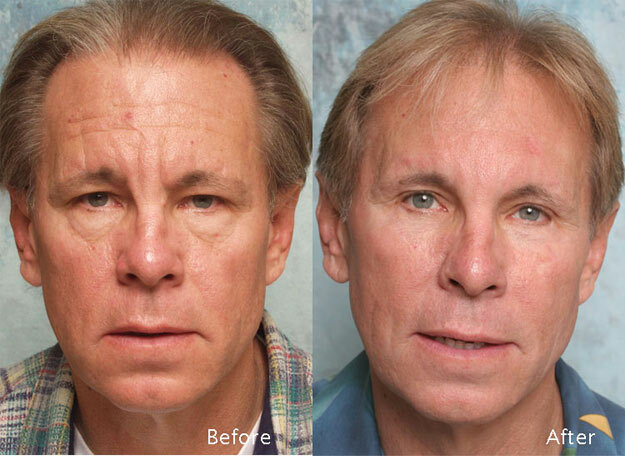 It is critical that men not have all of their features removed by cosmetic surgery. Men for the most part benefit from looking just a bit grizzled. In particular, it is important to leave a little skin in the upper eyelid so that the eyes are not feminized. He had about 1 week out of the office but was able to conduct business by phone the day after his surgery.